Relationships have their ups and downs – it’s just human nature – and require time, commitment and work to continue progressing. Even the best of relationships can reach a point where it seems like the flame is fading and a lot of times, couples have a hard time identifying exactly what the relationship is lacking. The state of a relationship can cause one to feel like their entire life is spiraling, so it’s crucial to pinpoint where the stress is coming from in order to begin a road to recovery. This Relationship Enhancement Package is designed to cut through the surface and get to the core of where relationship turmoil is coming from. Backed by nearly four decades of research, the assessment will offer simple and easy-to-implement suggestions on how to enhance and improve your relationship in a way that will positively affect all aspects of your life. Couples who are eager to learn new ways of maintaining and enhancing their intimacy, connection and friendship should consider exploring this assessment as a tool to help boost their relationship. 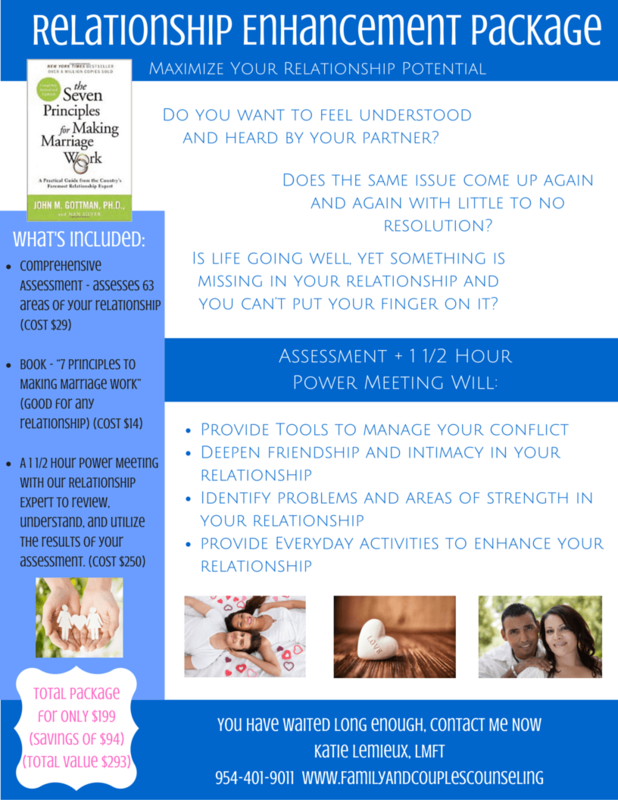 As an added bonus to the online assessment, couples who participate will receive an hour and a half Power Session with me to review the assessment results as well as a guidebook that provides tips and suggestions on how to repair challenges that couples may face during the course of their relationship. Take back control and call today to see if you qualify for the Relationship Enhancement Package.